Sending an international money transfer can seem complicated, especially when dealing with different terminology in a foreign country. If you see a word you don't understand, look it up here. As you familiarize yourself with the language, you'll find your understanding of money transfers as a whole will improve. A network of bankers and financial institutions responsible for creating and maintaining standardized best practices within the United States’ banking system. A unique nine-digit identification number assigned to financial institutions within the United States by the ABA. The first four digits are the federal reserve routing symbol, the next four are the ABA institution identifier, and the last is a check digit. Also commonly referred to as an ABA number, (ABA) Routing Transit Number, Routing Number, Bank Transit Number, or Transit Number. An electronic banking network used for direct deposit and direct debit transfers in the United States. A direct deposit or direct debit transfer processed within the United Sates via the ACH network. May take up to three working days to clear, depending on the banks’ operating schedules. Multiple payments can be processed in batches. Similar to BACS in the UK and EFT in Canada. Also known as an ACH direct deposit, ACH direct payment, or ACH direct debit. An intermediary or person hired to carry out a transaction on behalf of another person or entity. An increase in the value of a currency. The exchange rate at which a foreign exchange provider will sell a currency to you. Also known as the offer rate. For a customer, a lower ask rate is preferable since it means you will pay less to purchase a currency. A direct credit and direct debit clearing service offered within the UK where transfers take three working days to clear. BACS payments are either free or substantially cheaper than CHAPS payments but are losing popularity to FPS. BACS is similar to ACH in the United States and EFT in Canada. The first currency in a currency pair. The value of the base currency is set at 1 in a quote and the price at which the two currencies can be exchanged is reflected in the quote currency. For example, if the EUR/USD rate is 1.10 then 1 euro costs 1.10 U.S. dollars. One hundredth of a percentage point; 1bp = 0.01% = 0.0001. A basis point is a common unit of measurement in FX rates and interest rates. Often referred to simply a point. An account held at a bank that a customer may use to manage their money. The account can be used to hold customer deposits as well as allow them to make payments. Other forms of accounts are held with non-bank financial institutions, such as credit unions. A fee charged by a bank in order to hold an account or to process a payment. These include but are not limited to: transfer fees, wires fees, and foreign exchange commissions. Also known as service fees. The component of a BBAN and IBAN that indicates the bank. A bank identifier can be alpha or numeric digits, or a combination of the two. A unique nine-digit number used in Canada and the United States to identify financial institutions. Canadian transit numbers start with a leading zero, followed by a three-digit institution code and a five-digit branch code. See ABA Routing Number for the American routing number structure. The party receiving a money transfer. Also known as the recipient. A globally recognized unique bank account number that includes details about the financial institution and possibly also a branch location and check digits. Each country is responsible for its respective BBAN structure. Not all countries have adopted the BBAN. Refers to the first number to the left of the decimal point in an exchange rate quote, which changes so infrequently that FX providers often omit them in quotes. 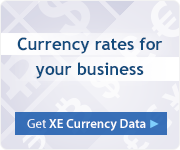 XE.com always includes the entire number in an exchange rate for clarity and transparency. The exchange rate at which a foreign exchange provider will buy a currency from you. Also known as the buy rate. For a customer, a higher bid rate is preferable since it means you will receive more for the currency you are selling. The difference between the bid rate and the ask rate. Often referred to as simply the spread. A globally recognized eight to eleven-character identifier used to represent a financial institution for interbank transfers. A BIC contains an eight-character business party identifier (i.e. the bank) and may be followed by an optional three-character branch identifier. The business party identifier consists of a four-character bank code, a two-letter country code, and a two-character location code. A list of these operational standard identifiers is maintained by SWIFT. Also known as a SWIFT code. See IBAN Calculator for more details. An American service where a bank account holder can set up a recipient in their online banking system in order to send them direct deposits. An Australian bill payment system where a customer may pay a business or other organization who is registered with the BPay system. The customer initiates a direct credit transfer via his bank, which must include the recipient company’s biller code and reference number. BPay transfers are processed same day if submitted by the cut-off time. Otherwise, they are typically processed next business day. The component of a BBAN and IBAN that indicates a specific branch of a financial institution. The exchange rate at which a foreign exchange provider will buy a currency from you. Also known as the bid rate. For a customer, a higher bid rate is preferable since it means you will receive more for the currency you are selling. The party that is buying a currency pair in a foreign exchange transaction. A national bank or banking organization, usually independent of government, that provides banking and other financial services to its country or member states. The central bank helps implement the government’s monetary policy, which includes setting interest rates and issuing currency. A UK service that provides same day electronic sterling transfers. CHAPS payments are expensive so are typically used for high value payments where the funds must be cleared right away, such as the purchase of a new car or home. If funds are not required immediately, more cost effective options are BACS or FPS payments. A check digit is a number added into a bank account number for error detection via a mathematical calculation. It helps validate the information and to protect against errors in the account number such as transpositions and missing digits. Check digits are the responsibility of the bank servicing the account. A check digit does not verify the account number is correct, it only checks whether it is possible for the account number to exist for a particular financial institution. A document that tells a financial institution to pay a recipient a specified amount from a particular account. The party writing the cheque must hold an account at the financial institution from which they are requesting the payment and must sign the cheque to make it valid. A fee or service charge imposed by a financial institution or FX provider for carrying out instructions from a customer, which may also involve advice given by the financial institution or FX provider. Commissions may be a flat rate charge or a percentage value of the contract in question. A written (electronic) document verifying the completion of a transaction. It includes details like dates, commissions and/or fees, settlement terms and the exchange rate. The second currency in a currency pair, it is the price for purchasing one unit of the base currency. Also known as the quote currency. A method of payment where a cardholder pays for goods and services by borrowing from the card issuer, with the promise of paying the card issuer for all funds owed by a certain date. A money transfer initiated by a bank account holder to be sent directly to a recipient’s account. An EFT that sends funds from an account in one country to another. Also known as international transfer. An exchange rate between two currencies that is calculated based on a third currency. Often refers to an exchange rate that does not include a country’s domestic currency. Currencies are quoted in pairs, such as EUR/USD or USD/JPY. The first currency is known as the base currency, while the second is called the counter or quote currency. The base currency is the ‘basis’ for the buy or the sell. Risk associated with fluctuations, particularly a depreciation, in the value of a currency. A card that debits the amount owing directly from a bank account. It be used to withdraw cash or to process an EFT via online banking. A money transfer initiated by a recipient’s financial institution. The recipient’s bank instructs the payer’s bank to send funds to the recipient’s account from the payer’s account. These instructions are pre-approved by the payer. Methods of debit transfers include cheques, drafts or electronic direct debits. The exchange of both traded currencies by the buyer and seller. In the case of a customer booking a transaction through an FX provider, it means the customer has paid the provider and the provider has paid the recipient. To put money into a bank account. The term also refers to a percentage of a contract that must be provided as collateral on some contracts, such as a forward contract. A decrease in the value of a currency. The country in which the bank account to which an EFT is sent is held. An EFT that is initiated by the recipient of the payment. The recipient sends the instructions to the account from which the payment is withdrawn. Pre-authorized instructions must be provided on the account prior to the sender’s financial institution’s processing the transfer. An EFT initiated by the bank account holder to be sent directly to a recipient account. Also known as a credit transfer. Similar to a cheque but funds are pre-cleared and the account holder does not have to sign a draft. A term used to describe any form of money transfer that involves electronic processing; no physical cheques, drafts, money orders or cash are involved. These can include direct debit, direct deposit, credit and debit transfers, as well as wires. EFT is also a term used in Canada to refer to ACH or BACS. Intergovernmental organization that promotes free trade and economic integration for its 4 member states: Iceland, Liechtenstein, Norway, and Switzerland. A political and economic union of 28 countries in Europe. The EU’s ongoing goal is to develop a single market that standardizes rules around settlement, employment and trade and ensures free movement of people, capital, goods and services within the region. Only some of its member states use the euro as their currency. The EU countries that have adopted the Euro as their official currency. Currently consists of 19/28 EU member states. Indicates how much of the quote currency it would cost to purchase one unit of the base currency. Often called a foreign exchange rate, FX rate or rate. A charge imposed by a financial institution or FX provider for foreign exchange or a money transfer. Also known as a bank fee or charge, service fee and transfer fee. The trading of one currency for another. Indicates how much of the quote currency it would cost to purchase one unit of the base currency. Also referred to more simply as the exchange rate or rate. A company that offers currency exchange and international payments. Although it can be a bank, the term typically refers to non-bank financial institutions. The majority of FX providers also focus on currency conversion with the intention of delivering a payment to a recipient, as opposed to speculative trading. A contract for which the buyer and seller agree to an exchange rate today but the settlement date is more than two business days in the future. If the price of the currency pair changes between when the contract is formalized and when it settles, the parties are still committed to the rate specified in the contract. Refers to the points that are added to or subtracted from the current exchange rate to obtain the forward price or rate. Forward points are based on an industry standard formula that takes into account the difference in the interest rates between the two currencies between the time of committing to the contract and its maturity date. A payment clearing service for direct credit and direct debit sterling transfers within the UK. The recipient can typically access the funds on the same day the transfer is initiated. These transfers cost about the same as BACS payments. FPS requires both the sending and receiving banks to be members of the FPS network in order to send a payment. A hedge is an investment that is used to offset potential gains or losses associated with the risk of another investment. Companies often used a forward contract to hedge against currency rate fluctuations in the future. An account number that contains unique bank account information in a standardized format to improve validation when making an international money transfer. It consists of a two-letter country code, two check digits and a BBAN. An IBAN can contain up to thirty-four alphanumeric characters depending on the country’s agreed upon structure. See IBAN Calculator for more details. The SWIFT IBAN Registry is considered the official registry for ISO-compliant IBANs. Canadian banking service that allows anyone with an account at a participating financial institution to send a direct credit transfer to a recipient securely via their email address. The recipient receives an email notification for the pending transfer that directs the recipient to deposit the funds directly into their account via their respective online banking. The transfer of funds from an account at one bank to another at a different bank. An EFT that transfers funds from one country to another. Also known as a cross border transfer. The transfer of funds from one account to another within the same bank. Also known as a same bank transfer. An independent, non-governmental organization that works in conjunction with SWIFT to ensure IBANs are standardized. A quote for which the base currency and counter currency are switched. An inverse rate is calculated by dividing one by the exchange rate. A transaction where the customer sets the price and the order is open until the market reaches that price. At that point, the order is filled as a spot transaction. A deposit required on forward contracts as collateral to cover the risk associated with potential exchange rate movements. Also used to refer to the mark up on a transaction. A call by an FX provider to raise the margin deposit requirement of an account. The call is typically made after a currency has significantly depreciated in value. A deposit required on forward contracts as collateral to cover the risk associated with potential exchange rate movements. Additional increase on the price or exchange rate of a currency. This is how banks and FX providers typically make a profit when dealing in foreign exchange. The ability to send payments to many recipients all at once. The date on which a contract is due to be settled. See also settlement date. The mid-point between the buy rate and the sell rate from the global currency markets. A certificate that acts like a cheque, which a recipient can exchange for a specified amount of cash on-demand in return. Money orders are often used by individuals who do not own a chequing account. A payment that does not involve cash. Methods include: wire, EFT, draft, and cheque, money order. A non-bank company or financial institution that processes money transfers. MSB’s may not hold deposits but are subject to many of the same regulations as banks. The rate at which a foreign exchange provider will sell currency to you. Also known as the ask rate. For a customer, a lower ask rate is preferable since it means you will pay less to purchase a currency. The party receiving a money transfer. 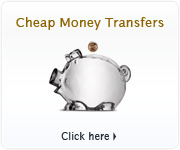 For money transfers and FX, typically known as the recipient or beneficiary. The party issuing a money transfer. A password, often three to eight characters in length for financial systems. A unit of change in an exchange rate. A pip is equal to a point for most of the major currency pairs since they are priced to four decimal places in the FX market. The Japanese yen is an exception since it is priced to only two decimal places. 1bp = 0.01% = 0.0001. Technically called a basis point but typically referred to simply as a point. A price or exchange rate someone offers to buy or sell a currency pair. The second currency in a currency pair, it is the price for purchasing one unit of the base currency. Also known as the counter currency. The price of one currency in terms of another currency. Also known as exchange rate. The party receiving the money transfer. Also known as the beneficiary. A numeric or alphanumeric unique identifier used to track a money transfer. A money transfer sent home by someone who is working abroad. The transfer typically involves exchanging funds from the foreign country in which the person is working to the domestic currency of their country of origin. Number used to redirect payments within a financial institution. Also known as ABA routing number in the United States, transit number in North America, sort code in the UK and Ireland. See ABA Routing Transit Number. The transfer of funds from one account to another within the same bank. Also known as an intra bank transfer. The party that is selling a currency pair in a transaction. The person or company that initiates a money transfer. Formed to facilitate cross border euro transfers within the EU and EFTA. With SEPA, it is now possible to manage all euro payments from a single bank account within the region. Although still able to charge a transfer fee for SEPA payments, banks are not permitted to make deductions from the amount transferred. SEPA transfers are euro direct credit and direct debit transfers within the EU. SEPA payments are moving toward only requiring an IBAN to process and typically take one to two business days to clear. Fee charged by a financial institution or FX provider related to the holding of an account or to process a money transfer. These include but are not limited to: transfer fees, wire fees, and commissions. Banks typically refer to these as bank charges or bank fees. The date on which a contract settles, meaning all payments agreed to in the contract have been sent. See also maturity date. A six-digit numerical code used by Irish and UK banks to route payments within those countries. The codes are broken into three groups of two and contain details on both the bank and branch. Similar to a transit number in North America. Entering into a foreign exchange contract with the intent of profiting off the movement of a currency value. A foreign exchange contract based on the spot rate and the settlement date is within two business days. The current market price for a currency pair. The difference between the bid rate and the ask rate of a currency pair. Also known as the bid-ask spread. A cooperative organization that promotes standardization for financial transactions. A globally recognized eight to eleven-character identifier used to represent a financial institution for interbank transfers. A SWIFT code contains an eight-character business party identifier (i.e. the bank) and may be followed by an optional three-character branch identifier. The business party identifier consists of a four-character bank code, a two-letter country code, and a two-character location code. A list of these operational standard identifiers is maintained by SWIFT. Also known as a BIC or BIC code or BIC/SWIFT Code. See IBAN Calculator for more details. A payment that involves a third party (i.e. not the customer or the recipient). It can involve a third party processing or paying for the transaction. Fee associated with a money transfer. 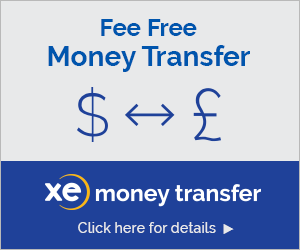 Transfer fees are separate from FX commissions and can apply to a same currency transfer. A unique number assigned to financial institutions within North America to identify the bank and branch to properly route payments to their proper destinations within Canada and the United States. Similar to the sort code used in England and Ireland. See ABA routing number for the American transit number structure and bank transit number for Canadian transit number structure. The concept of a customer being able to view the breakdown of the costs associated with a transaction. A future date for which a price is set for a foreign exchange transaction. For spot contracts, the value date is typically the same as the settlement date. A secure EFT that requires a SWIFT code or IBAN that is processed via the SWIFT network. Wires are a more expensive form of EFT that can be sent domestically or internationally. The funds are guaranteed and cannot be recalled. They usually take a couple days to clear, with international wires taking even longer depending on how many banks are involved in the transfer.